Serious automobile accidents can cause a lifetime of physical pain and cost thousands of dollars in medical expenses and lost wages. If you or a family member has been injured in a car or truck collision caused by another person’s negligence, his or her automobile insurance company can be held liable for your damages. Not surprisingly, the insurance company is not always willing to voluntarily offer fair compensation. With serious collisions, you should speak with a knowledgeable Hoke County personal injury attorney. While the law offices of Maginnis Law are based in Raleigh, our attorneys practice throughout the state, and attorney Shawn Howard is from the Hoke County area. To speak with Shawn, call the firm at 919.480.8526 or send a confidential email inquiry using our contact page. One of the many risks of handling your own automobile accident personal injury claim is North Carolina’s harsh “contributory negligence” rule. This outdated legal principle holds that if your actions are a contributing proximate cause of your injuries, you are not entitled to a recovery (with some exceptions). Insurance adjusters are well schooled in this rule and will often try to take recorded conversations to elicit statements that may be used out of context to deny a claim. If the adjuster is asking for a recorded statement, you should probably contact a Raeford car accident attorney. If you can prove that another party was negligent in causing a collision, you are entitled to recover fair compensation from that at-fault driver’s insurance company. The damages recoverable may include compensation for (1) medical, pharmaceutical, and other healthcare expense; (2) physical and emotional pain and suffering; (3) lost wages, past and future; (4) permanent impairment; and (5) permanent disfigurement. If the driver was intoxicated at the time of the collision, you may also be able to recover punitive damages. An important inquiry in every high impact auto collision is what automobile insurance coverage is available. The car accident lawyers of Maginnis Law are knowledgeable with respect to coverage and can help determine all sources of liability, underinsured motorist, uninsured motorist, med pay, and umbrella coverage that may be applicable. This is can be critical to making a full recovery, as many motorists only carry $30,000.00 in liability coverage, the minimum in North Carolina. The North Carolin attorneys of Maginnis Law offer free consultations to all prospective personal injury and auto accident clients. All injury claims are handled on a contingency fee basis, meaning that you only pay attorneys’ fees if and when we resolve your claim by a verdict or settlement. To discuss your Hoke County car accident case with attorney Shawn Howard, call Maginnis Law at 919.526.0450. 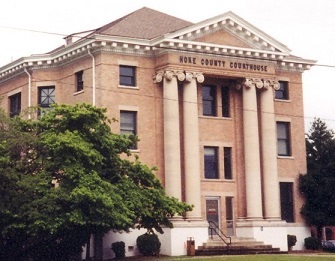 The firm handles cases from all over Hoke County, including Raeford. Our experience includes cases involving serious back, neck, brain, shoulder, elbow, and knee injuries.